Saves all that washing up. 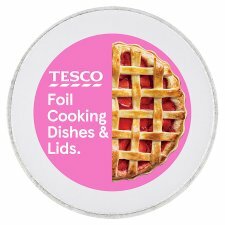 Tray Size: 215mm Diameter approx. Disposable. WARNINGS Not suitable for use in microwave oven. Do not place roasting tray near electric elements or naked flames for your own safety. Handle with care when removing from oven as it will be hot. Please support base. Allow foods to cool before storing in refrigerator. Before use remove label and wash tray. Cooking acidic foods and salty foods may damage the foil tray. To avoid this, please coat the tray with cooking oil. When using the tray for roasting please support bottom of the tray and wear oven mitts or equivalent before taking it out of the oven for your own safety. Suitable for freezing down to -20°c and cooking up to 250°c.